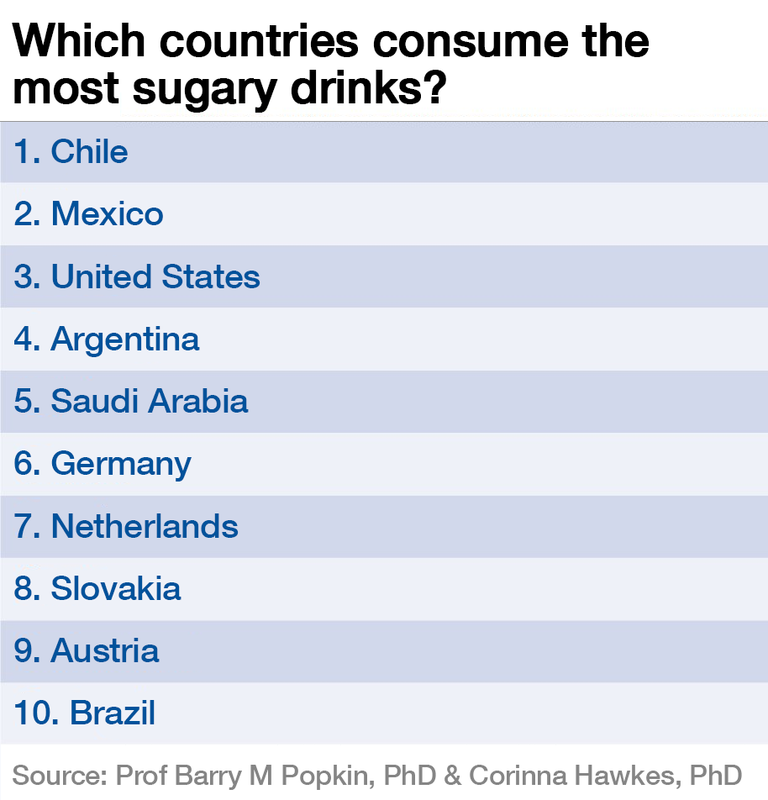 Which countries consume the most sugary drinks? Americans are no longer the biggest consumers of sugary drinks, a new studyhas found. The report, published in the medical journal The Lancet, shows that sales of sugary drinks in the US have declined since 2000, when the country occupied the top spot. By 2014, it had dropped to third place for highest per-capita sugary drink consumption. Chileans are now the biggest consumers of sugary drinks, with an average of 190 calories sold per person per day. China, Thailand and Brazil have also seen a rise in sales. The report’s authors, Barry Popkin and Corinna Hawkes, also noted that consumption of fruit drinks was growing in Asia. Popkin and Hawkes compiled sales data from Euromonitor to look at global consumption of sugar-sweetened beverages. Mexico, Argentina and Saudi Arabia featured in the top five, although consumption in Mexico is declining. Governments around the world are aiming to reduce the consumption of sugary drinks, from taxation policies and public-awareness campaigns to restricting sales in schools, with varying levels of success. The researchers compare Chile and Mexico’s initiatives, and say that only Mexico’s (which included a media campaign linking sugary beverages to diabetes and a “soda tax”) has worked. Chile’s policy, on the other hand, focused on direct discussions with congressional representatives. Consuming too much added sugar has been linked to obesity and poor cardio-metabolic health (your chances of having diabetes, heart disease or stroke). Despite a decline in soda sales in many countries, more fruit juices, flavoured water drinks and energy drinks are being bought. The authors say the health effects of these beverages are not yet fully understood, and further research is needed before they can be recommended as a healthy substitute for sugary drinks. The researchers also argue that more needs to be done to reduce sales of sugary drinks. “We believe that action is needed to tackle the high levels and continuing growth in sales of such beverages worldwide,” they say. Which countries eat the most sugar? Author: Emma Luxton is a Digital Content Producer at Formative Content. Image: Brothers drink soda as they sit in the shade on a hot day. REUTERS/Lucy Nicholson.